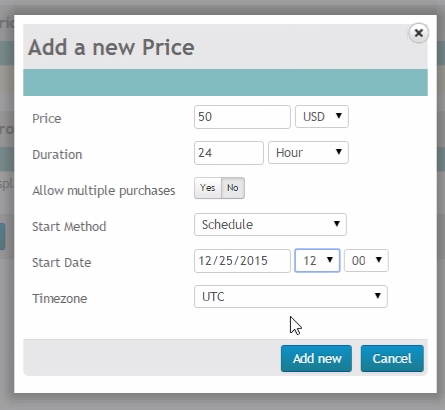 In this video tutorial, we’ll be looking at the monetization options in your DaCast Channel. DaCast’s Pay Per View video platform includes adding Pay Per View tickets, setting up Subscriptions, and using Promocodes. Live Streaming Broadcasts can be a great source of revenue for your events and regular broadcasts. Typical paywall models include a one off payment, or subscription model for repeat broadcasts that are scheduled ahead of time. Free trials have the ability to set up between 1 and 3 prices per video content and an unlimited number of promo codes per video content. After the free trial has ended, you will need to purchase a Pro plan or a 5TB Event plan to get access to the paywall. 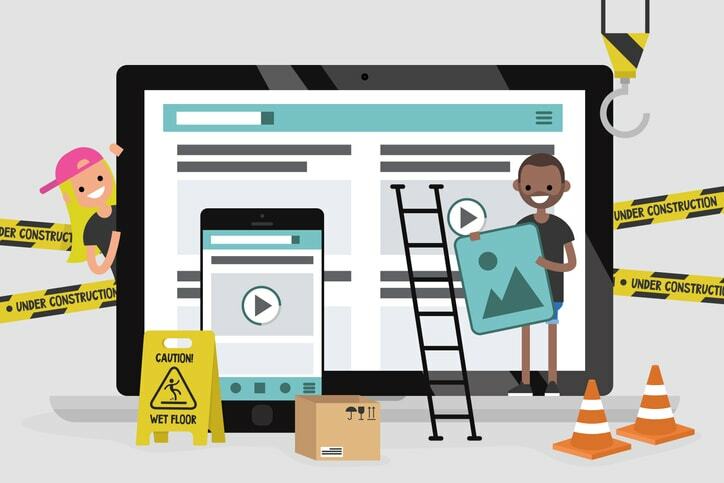 What is the Best Way to Monetize Web Video? Start by logging into your DaCast account, going into the channel you want to monetize, and click the “Monetization” tab. Adding your first price will turn on the paywall for your channel. You also have the possibility to use the “Batch configure” menu if you want to apply the same price to several video files. To add a price to your broadcast, click “Add Price”. 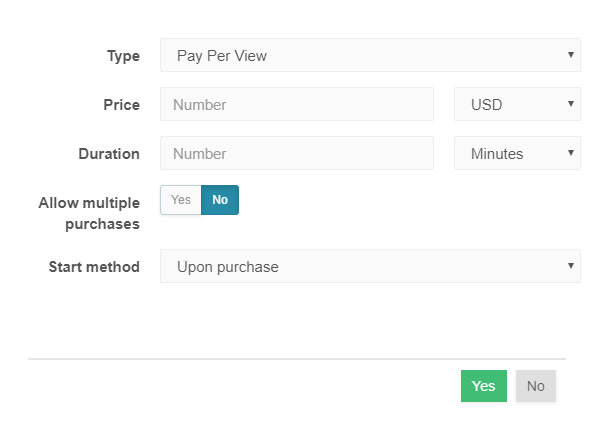 This will open up a window where you have a number of options to set up your price. You can add as many prices as you like except on Free trial (limited to 3 prices per video file). The Price can be set to USD or EUR. For “Duration” we suggest that you allow ample time for your viewers to enjoy their product. For instance, a Soccer match lasts 90 minutes, but that shouldn’t be the duration because there is also the Half-Time break. Also, what happens if there is a problem, and the match starts late? If your viewers only have a small amount of time allotted, they can miss out on your broadcast. For these reasons, we strongly suggest you set the duration to at least twice the duration of your whole broadcasts. If you are only broadcasting once a week, you can set the duration to 24 Hours. By default, multiple purchases of tickets is turned off. If you want to let viewers buy more than one “ticket” of access at a time, please turn it on. Finally, you can set whether your ticket activates “Upon Purchase” or “Schedule”. 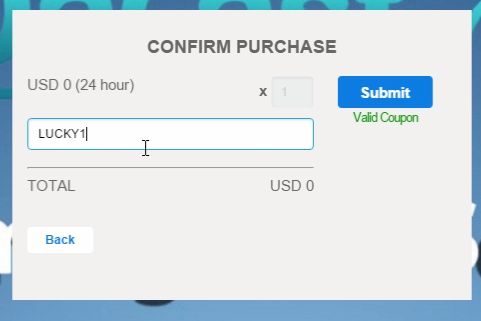 If the ticket is set to “Upon Purchase” the duration timer will start as soon as a viewer makes their purchase. Than can watch as much content as they like in that time, but when the timer runs out their viewing experience ends. Alternatively, you can “Schedule” your tickets. This means that the timer for the duration does not start until a specific date and time. All times are UTC, so be sure to check the time difference between your viewers and UTC. 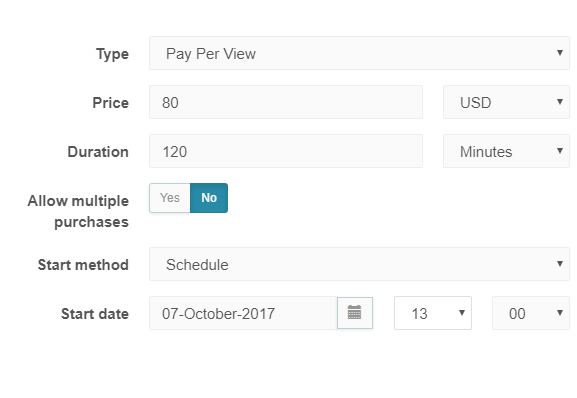 As well as Pay Per View tickets, you can create Subscription tickets. On the left side of the window, click on the “Subscription” tab. Click “Add Price” to create a Subscription ticket. The price can be in USD or EUR. 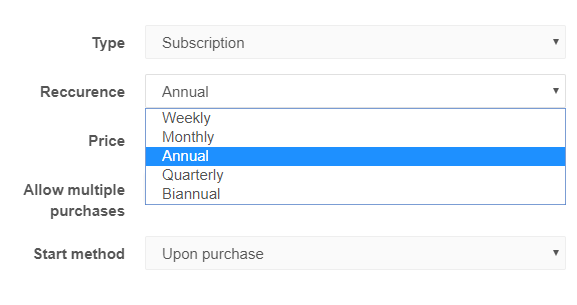 The Subscription can be set to Weekly, Monthly, Quarterly, Annually or Bi-Annually. Click “Add” when you’re done. 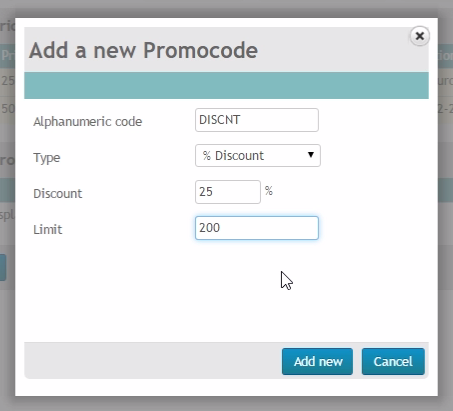 Adding Promocodes is as simple as adding Prices. Promocodes either apply to Pay Per View tickets, or Subscription tickets, but only one or the other. To add a promocode click “Add Promocode”. Create a 4-6 character alphanumeric code. Make it something that’s easy to remember like XMAS25 or LUCKY1. Then choose how you want your promo to work. It can be a percentage Discount (e.g. 25% off), a flat Monetary Discount (e.g. $10 off), a Free Pass, or a Gift. 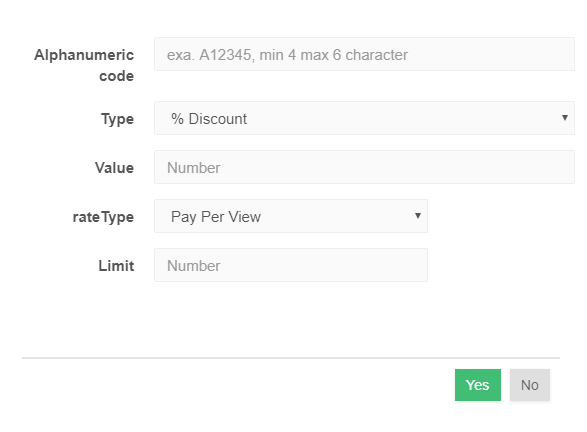 Finally, set the Limit for your Promocode. This will determine how many people can use the promocode before it runs out. You’re all set to start broadcasting with a paywall. Make sure to save your changes and allow 5-10 minutes for the changes to take effect. 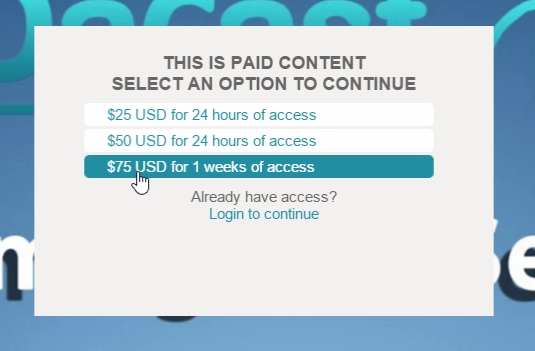 When a viewer tries to watch your broadcast, they will now see a paywall and be prompted to pay before watching your content. To use a promocode, a viewer just needs to click on one of your channel’s tickets and then enter the promocode where prompted. A promocode will come up as “valid” if it is spelt correctly, and if it is still available. If you have an questions or suggestions for future tutorials, feel free to leave them in the comments below, or reach out to us on Twitter or Facebook.